A group of protesters march in Palo Alto on Monday, Nov. 14, 2016. About 200 to 300 protesters are headed toward Highway 101 and Marsh Road in Menlo Park, police said late Monday afternoon. The march appears to be in protest of President-elect Donald Trump. 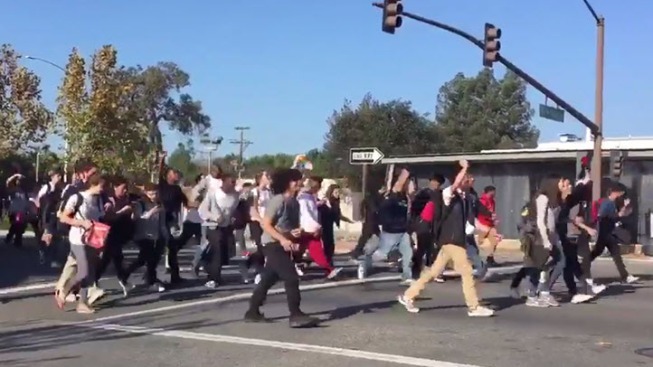 The group of high school protesters earlier marched through downtown Palo Alto. Large group/protestors heading twds Hwy 101/Willow or Hwy 101/University blocking roadways. Please avoid the area or use caution. Peaceful high school protesters are in #MenloPark marching Bayfront Expressway (84) toward westbound Marsh Rd to Middlefield Rd.